Hugo Schmitt was born in Bann, (Rheinland-Pfalz) Germany, son to Anna-Maria and lumberjack Peter Schmitt. 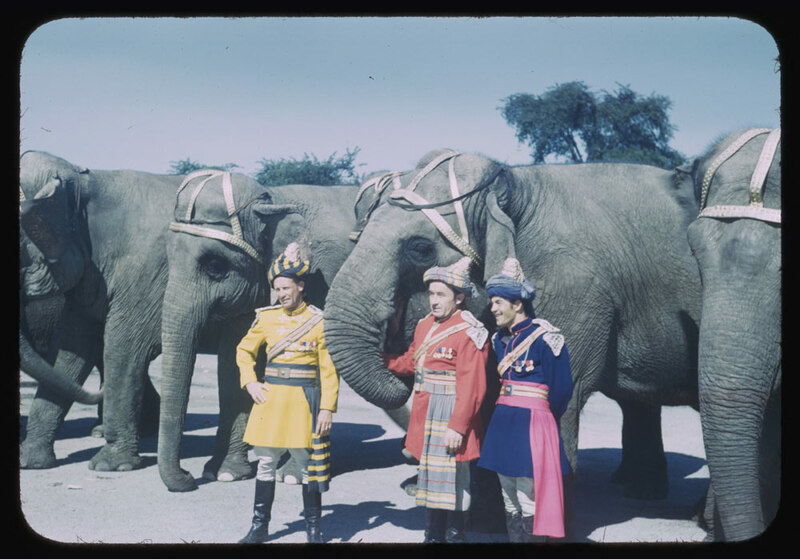 Schmitt started as Zookeeper at Hagenbecks Zoo, learned elephant training from William Philadelphia, and advanced to head elephant keeper, and then became chief trainer of elephants at the Hagenbecks Circus. During the 30�s he went several times to India, in order to select elephants to import to europe, and he married Jenny, from the island Sylt, in north Germany. Hugo Schmitt had accompanied Hagenbeck's Circus to London for the winter season of 1936 to 1937 at the Royal Agricultural Hall in Islington, and among his herd of elephants had two (at that time rare) African specimens. He was one of the first trainers to work with the species. In July 1943 phosporus bombs fell on Hamburg, and Hagenbecks Tierpark was more or less destroyed in 90 minutes. 400 animals lost their lifes. During the first bombs however, a zoo-keeper took the chains of the elephants, and released them into the out enclosure. It was obvious that the valuable elephants were at risk. Circus Hagenbeck sent Hugo Schmitt to Sweden in 1944 with the five best elephants, since Sweden was neutral, in order to save them. Hugos family stayed behind in Hamburg. But contrary, one day was written in the Swedish newspapers, that the elephants was confiscated as spoils of war by Sweden. Upset by the decision of the Swedish govenment to sell the animals of the former German-owned Carl Hagenbeck Circus, a German elephant trainer turned loose the show's five bulls in Malmoe Feb. 23. The elephants charged down main street smashing windows, breaking lamposts and terrorizing citizens. Police, after vain attempts to halt the animals, appealed to the trainer, Capt. Hugo Schmidt, to round them up. Weeping bitterly, Schmidt finally consented and regained control of his charges. With tears streaming down his face, Schmidt said: The State is making a great mistake in selling them. They have been trained together and love each other. If they are parted they will die. 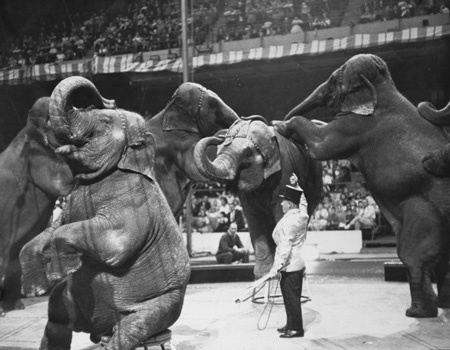 Mr Hagenbeck contacted Ringling Brothers and Barnum & Bailey Circus in U.S.A. and offered the elephants. Mr Ringling came personally to Sweden and purchased the elephants, on condition that Hugo Schmitt came with them as trainer, and managed to arrange a Visa for him, so he could go with the elephants to USA. Hugo Schmitt (center) and assistants, Chicago, Illinois, Aug. 4, 1949. Hugo Schmitt went with the elephants to U.S.A. and the five elephants Icky, Karnaudi, Minjak (captive-born), Mutu and Sabu arrived at Ringlings in 20 June 1947. Now Hugo Schmitt was responsible for Ringlings previous 38 elephants, plus the 5 ones he brought from Sweden. Together with Hugo and the elephants, came also Axel Gautier as Schmitts assistant. The rest of the Schmitt family stayed behind in Hamburg until 1948 when they got visas to go to Sweden, where they stayed in Malm�. Finally, in the end of 1950, Hugos wife Jenny, and their two sons Manfred and Hugh went with the ocean liner "Stockholm", departing from Gothenburg, to New York and America. Hugo Schmitt worked for Ringling Brothers and Barnum & Bailey Circus from 1947 to 1971, but also on other shows like Mills Bros. Circus 1950-1953, and 1956 when he was with Leonard Bros. Circus. He made a brief return to Europe in 1963 when Ringling sent a unit to tour in Britain, and was given the job of handling a group of elephants bought from Chipperfield's Circus. Hugo Schmitt is said to have performed with 55 elephants at one time in the ring at Ringling Brothers and Barnum & Bailey Circus, according to the Guinnes Book of Records. "There are two fine trainers in the U.S. today, Mac MacDonald and Hugo Schmitt. In comparison, the balance are a sorry lot. It is my opinion that Schmitt is by far the best elephant �trainer� ever employed by the Ringling Show." A portion of a letter from Bill Woodcock (1/8/61) to Chappie Fox. Jenny Schmitt died 1999. Hugo Schmitt died in Sarasota in 1977. Hugo Schmitts sons were both performing with their father from young age. Manfred Schmitt, born 1942 in Hamburg-Stellingen, Germany. Passed in 1996 in U.S.A. Children: Deborah and Mark A. Schmitt. Hugo Schmitt also has a son born in Malmö, Sweden.